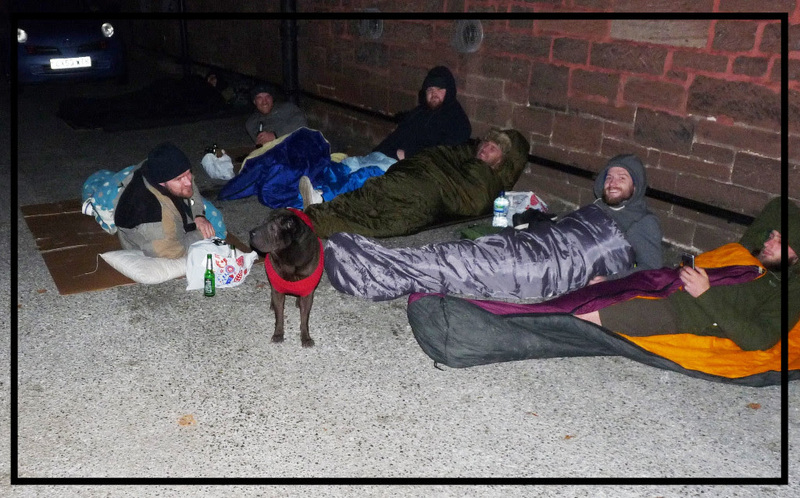 Events / CATH Sleep Out 2016 – A Great Success! All Saints, Hoole were once again out in force, joined by a fellow parishioner bearing hot mince pies. Reg Bolton, the CATH Finance Director and long time sleep out stalwart along with his wife Jane (both All Saints parishioners), could not be with us due to illness. Not to be defeated, Reg, during his hospital stay, persuaded the Countess of Chester physiotherapy team to attend in his place. Six of the most enthusiastic physios you could ever want to meet strode into the Friary car park with a shared purpose – to fill Reg and Jane’s shoes. They made a real fist of it but whether they got any sleep as first timers is doubtful. If they join us again next year for the 25th anniversary of the sleep out they will. It was a marvellous night. All of the staff, trustees and volunteers in attendance made sure it went swimmingly well (not a reference to the rain), with many veterans of previous sleep outs putting in another shift. It isn’t possible to list them, but they know who they are and how much support they have given CATH over the years. There was also a big number of first timers who fitted in seemlessly. It is too early yet to say how much will be raised but we are certain that it will be in excess of £12,000, a fantastic sum of money to come from one event. Everyone at CATH are so grateful to each and every one of them.